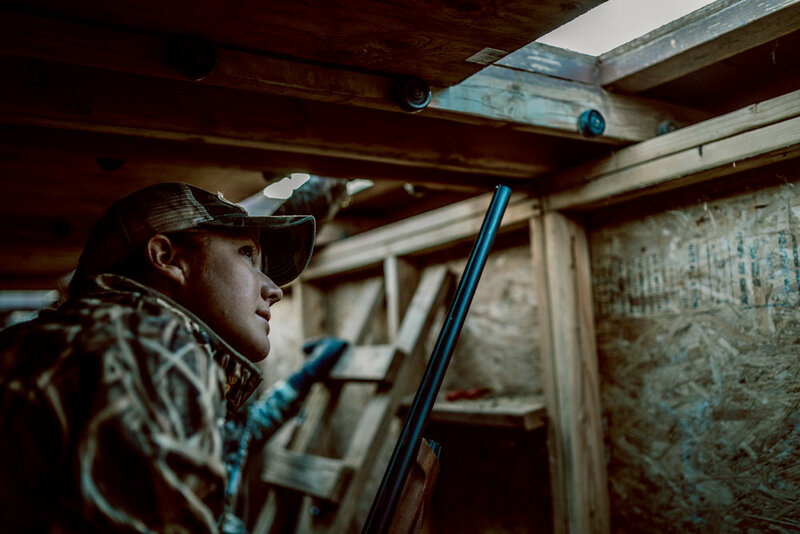 With the sun creeping into the sky we all hustled to set out hundreds of decoys around the blind. Up before the sun, I'm hurdling the Elephant (the name of my van) down I-25 towards the Donut Shop. That may be the best way to drag me out of bed before the sun is up, DONUTS. I arrive at an almost empty parking lot, but the Open sign is flashing. With a giant breakfast burrito down my gullet and a 4 pack of donuts for the blind, I am ready to tackle the day. One by one, women clad in camo pour into the donut shop. Mentors and Mentees - All excited about what the day will bring. Courtney is an avid hunter and competitive shooter. We met at a Backcountry Hunters and Anglers Pint Night in Denver. I am impressed with how willing she is to welcome and teach new hunters about shooting and hunting. 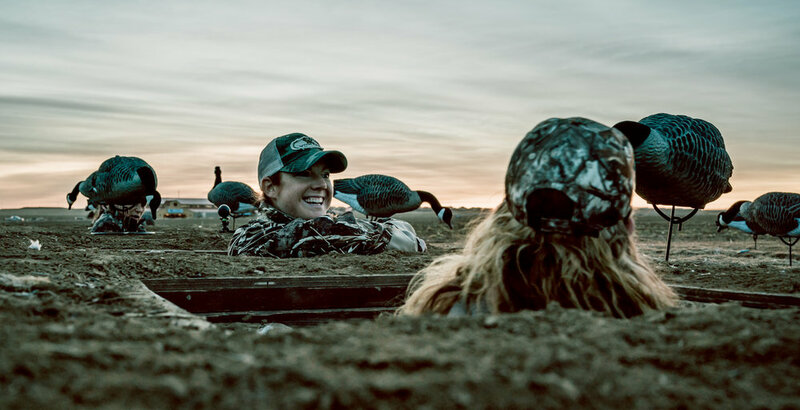 I was invited by Courtney Nicolson to join a group of women on a goose hunt. Lisa Thompson, whom I have worked with on a previous Cabelas photo shoot, and Donnelle Johnson have organized the day as part of Step Up Step Out. Step Up Step Out became an official non-profit last year. The mission of Step Up Step Out is Changing the World One Hunter at a Time. Lisa Thompson on the left and Donnelle Johnson on the right pop out of the blind ready to take aim. 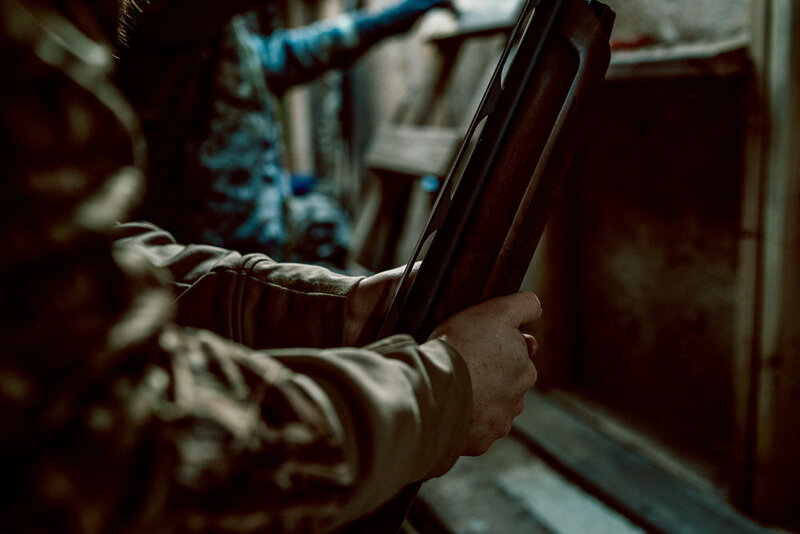 With hunter numbers dwindling and conservation of wild places being so dependent on hunters I am glad to see women like Lisa, Donnelle, and Courtney taking an active role in mentoring a new generation of hunters. The day was filled with excitement. These first-time hunters were able to experience shooting at their first query. Some even shot and killed their first goose. They learned about safety in the blind. The learned about calling in birds and setting up decoys. And finally, they learned how to field dress and consume the animals they had just killed. With the current threats to the environment, be it public lands or private, the air, water and earth need more people who are willing to stand up and speak on its behalf. So, I challenge you to step up and step out with a first timer. Whether you take someone on their first mountain bike ride, first ski tour, first hike or first goose hunt. We need all of those first-timers to have more and more positive experiences in wild and sceninc places. A special thanks to Field Staffer Brian Haas with Dakota Decoy Company for donating his time and hundreds of desoys, for the sake of new hunters on a mission for their first goose. Also a big thanks to the Cleland/ Kosorok families for the opportunity to harvest Canada Geese in style. Cracking jokes and waiting for the birds to fly! Lisa shows the first timers how it's done, Bird Down! Happy First Time Goose Hunter! This was after all a Hunt To Eat adventure. All of the participants were keen on learning the most important step, butchering the animal. With the birds heading to water and the hunting slowing down, Lisa cooked a feast of brats and hot links!